With the advent of technology, a lot of companies are actually adopting digital transformation, and this trend has been increasing day by day. In order to utilize the technology, the organizations need various tools and dedicated manpower who are competent enough to digitize the entire process. To address the gaps, we have a new tool “UI Path” which is a smart, reliable and robust tool which can be utilized effectively to automate repetitive tasks. 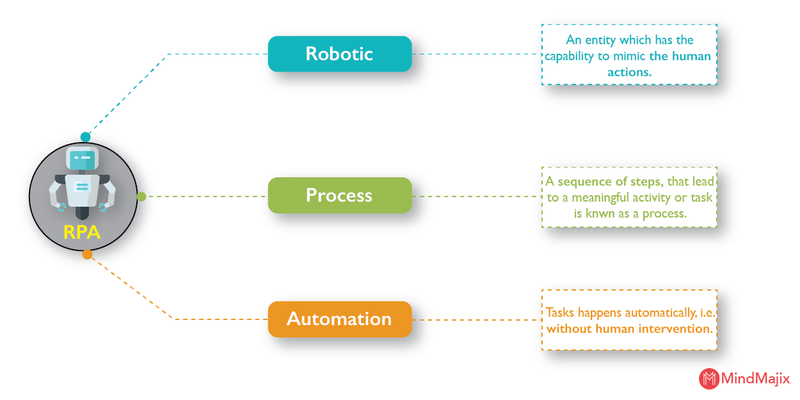 RPA stands for Robotic process automation. It is a software tool, equipped with Artificial Intelligence (AI) and (ML) Machine learning abilities which in turn can handle repetitive tasks by automation. The use of RPA tool has drastically increased productivity and reduced man-hours. Few examples of repetitive tasks are: queries, calculations, transaction record maintenance. 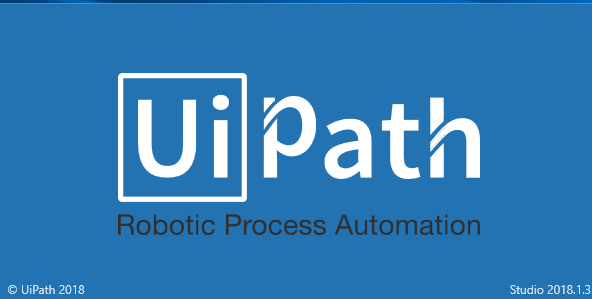 UiPath is one of the best industry standard RPA ( Robotic Process Automation) tools which provides end-to-end solutions to organizations where they can completely automate their recurring office tasks. This tool was founded in the year 2015 by a Romanian entrepreneur named “Daniel Dines”. UiPath helps the organizations to completely convert their boring repetitive tasks into an automation process where they can be worked with other multiple tools. These core tutorials will help you to learn the fundamentals of UiPath. For an in-depth understanding and practical experience, explore Online UiPath Training. 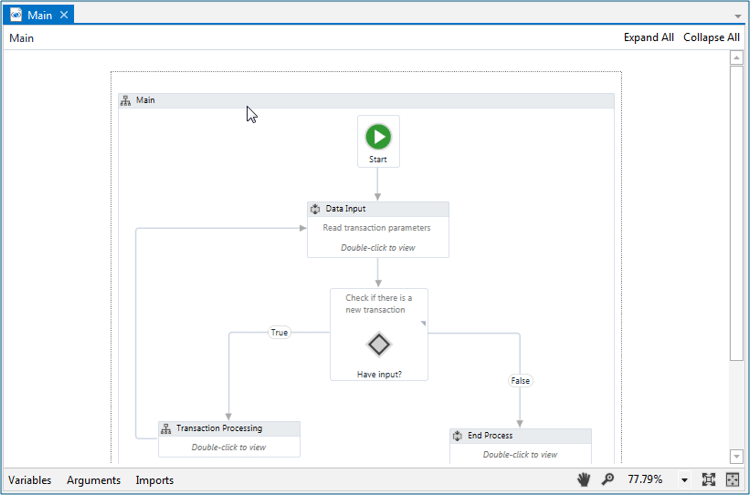 Uipath Studio: Uipath studio has an interface where the users will be able to define the automation process visually with the help of diagrams. These diagrams will have or represent a type of work to perform. UiPath Robot: The first step is to design the entire process and later execute the same within the studio. As the process is defined and executed, robots will start picking up the defined steps and execute those without any human intervention. Also, these robots are designed to work in a scenario where humans/individual can trigger the process. UiPath Orchestrator: This tool is a web-based application. Using this tool one can deploy, schedule, monitor/manage robots and respective processes. This is a centralized platform to manage all the robots. In this section of the article, we will discuss the UiPath tool features and their uses. The tool can be hosted in all cloud environments and virtual terminals, so hosting is pretty flexible while using this tool. It has a web and desktop application so users can use this tool based on their availability. Having both web and desktop applications is a benefit. Security is given highest priority by UiPath, and they have implemented few security measures where the data and the users will be safeguarded. UiPath has implemented Account lockout settings feature, and using this feature the users will be protected from brute force attacks. If the user is connected to multiple machines with the same Log in details, the system will automatically detect and ends the login session for the first machine. So basically, the user will stay active in the single system at any given point of time. To protect the user data, Uipath has implemented a feature where it restricts the autocomplete feature of the web browser for all of the orchestrator credential fields. This is an extra precaution that Uipath has taken into consideration. With the help of advanced screen scraping solution, it can work with any kind of applications like Java, SAP, Flash, .Net, etc. The benefit of using this feature is the user will acquire perfect accuracy. This tool is reliable for modeling business processes. The Uipath studio offers a lot of automation capabilities. The tool comes up with effective and efficient debugging and exceptional handling systems. In this section, we will discuss the steps that are necessary to install UiPath. 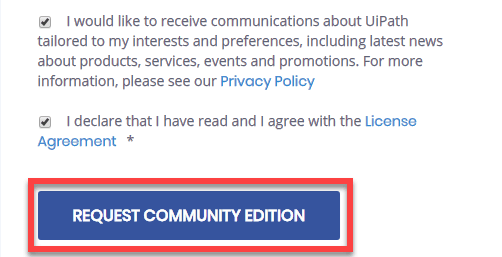 Step 3: Click on “Request Community Edition” button as shown in the below screenshot. 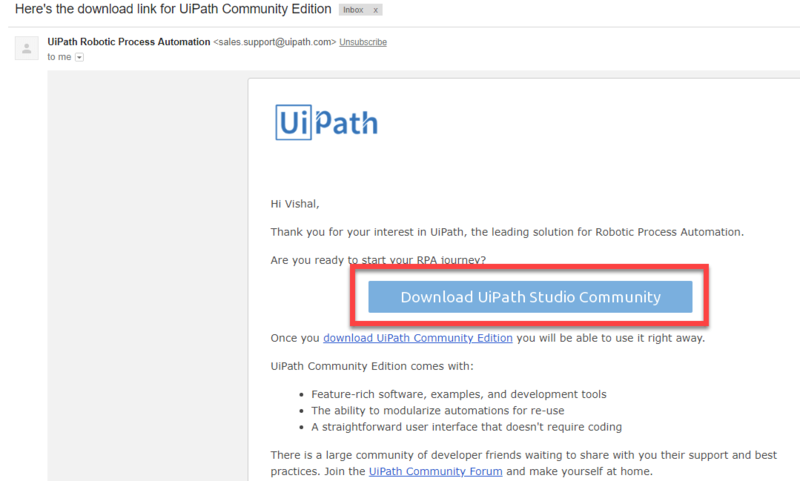 Step 4: Uipath will send out an email ( i.e. the registered email) with the download link option. Step 5: After the file download, click on the setup file. Step 7: To activate the account, please provide the Email address and click on the Activate button. The device id will be automatically detected. Now, click on the Activate button. This completes the entire Uipath installation process and the tool can be used right away on your PC. In this section of the article, we will discuss the Uipath GUI. 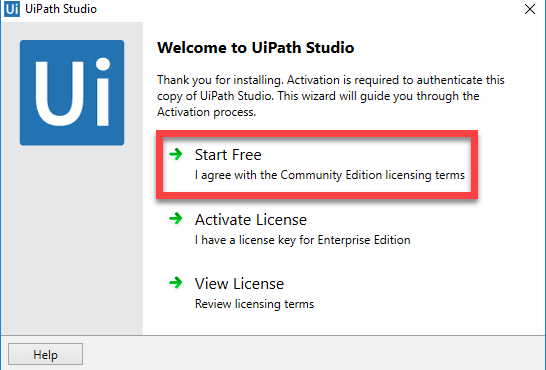 The following are the Uipath components which we can see within Uipath Studio. 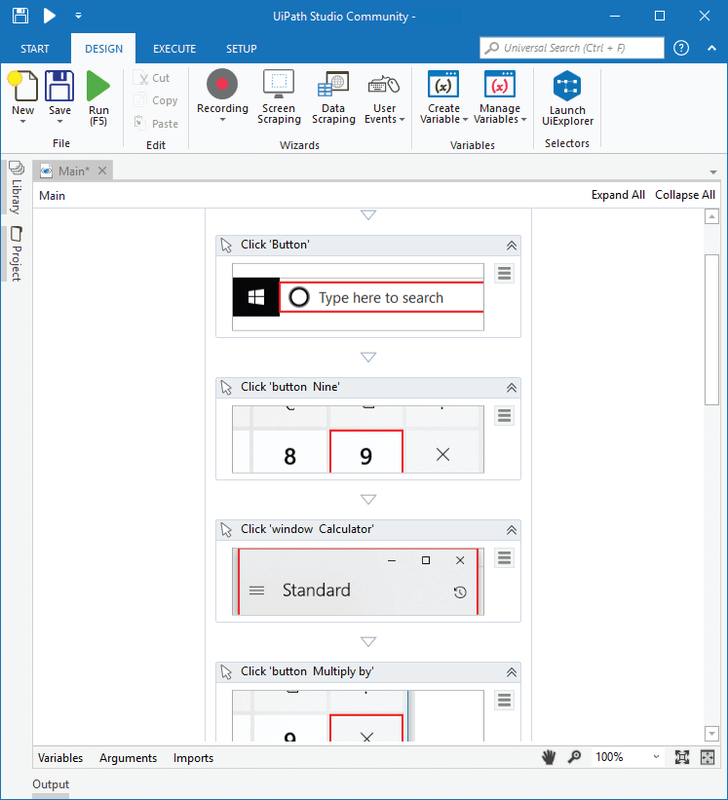 The Ribbon: It is an integral part of the Uipath GUI and the user will be able to access all the menus from the ribbon. Click on “Start” option, the user will be able to create a new project. 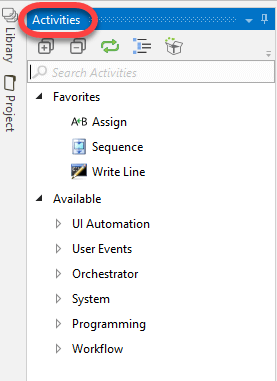 Clicking on “Open” the user will be able to open an existing project. The options can be seen below in the screen attached. Design: Using the design section, the users will be able to see or launch flowcharts, access wizards, and manage variables. Execute: It helps to execute a project or to stop any of the projects. Setup: It helps to publish a project, create shortcuts for the projects, schedule the tasks, and lastly install the extensions. The Universal Search Bar: The user will be able to use the universal search bar to search for activities, projects, designer panels, and libraries. 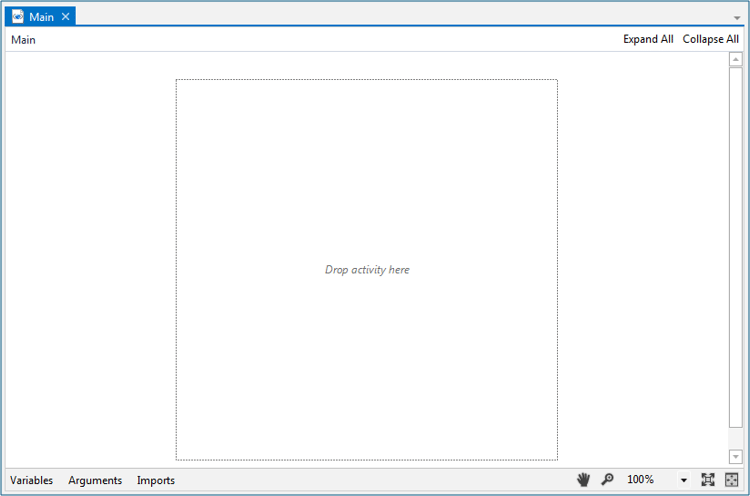 The Activities panel: This panel provides quick access to the available activities and it can be dragged to the current project. The Library panel: Using this panel, the user will be able to reuse automation tasks. The project panel: Using this option, the panel will allow the contents of the project and at the same time, it will help to open the file location of the project in windows explorer. Within the market, we have a lot of automation tools which are industry standards, for example, Selenium, Waite, etc. These automation softwares work effectively on the web applications but has limitations when it comes to desktop applications. So, to accommodate the automation for desktop applications, we can definitely use Uipath. 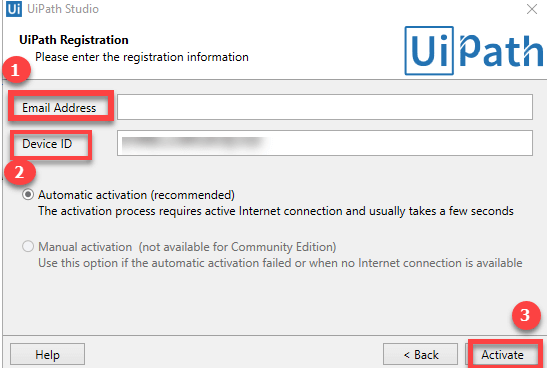 Desktop automation: Uipath can be used with desktop applications, this is a unique feature compared to other automation tools. Remote applications: The Uipath tool is completely flexible and capable for remote desktops. Data handling processes and techniques are better in Uipath when compared with other automation tools that are available in the market. Writing logic and the methodology is far better compared to other automation tools. Pricing: From the pricing point of view, Uipath is cheaper when compared to their market competition. Also, it is easy to deploy and adopt. In this section, we will discuss the steps which will help you to create a sample Uipath Script. 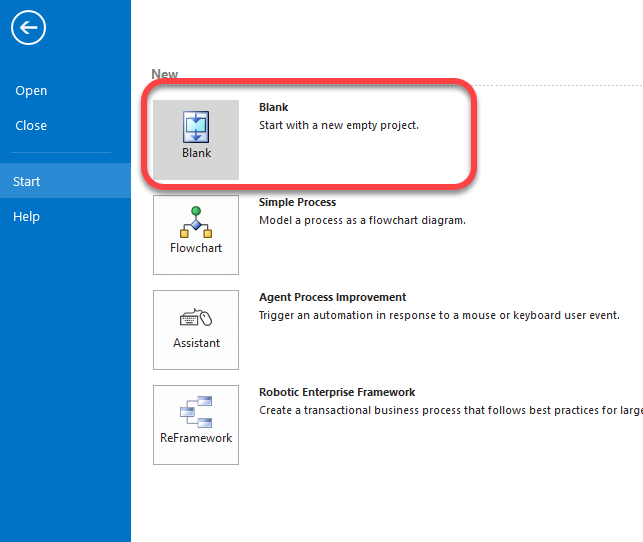 Step 1: Open the Uipath tool, click on the “Blank icon” as per the figure below, highlighted in the red box. 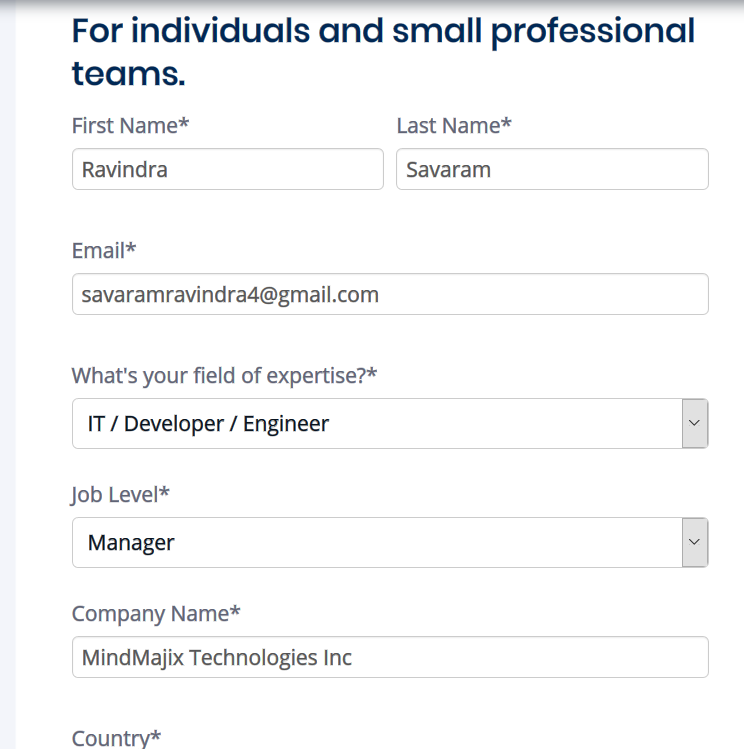 Step 2: In this step, please enter the “Project Name” and add the project description. Click on “Create” button to create a new project. 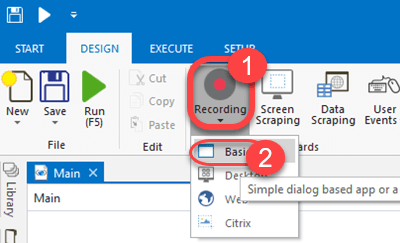 Step 3: Uipath tool interface will open up, click on “Recording”, highlighted in the below figure. 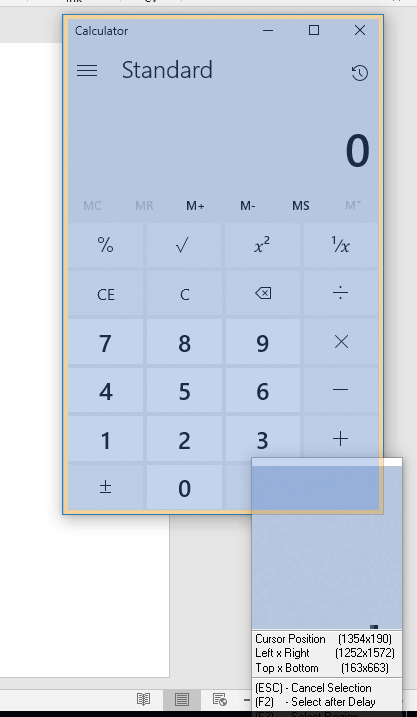 Click on “Basic” from the options. 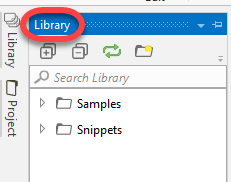 Step 4: A new window will open up where you will be able to see an icon “Record”. Click on “Record” icon again. Highlighted in the below figure. Step 5: The entire screen turns into blue color and all the icons are highlighted as shown in the below figure. 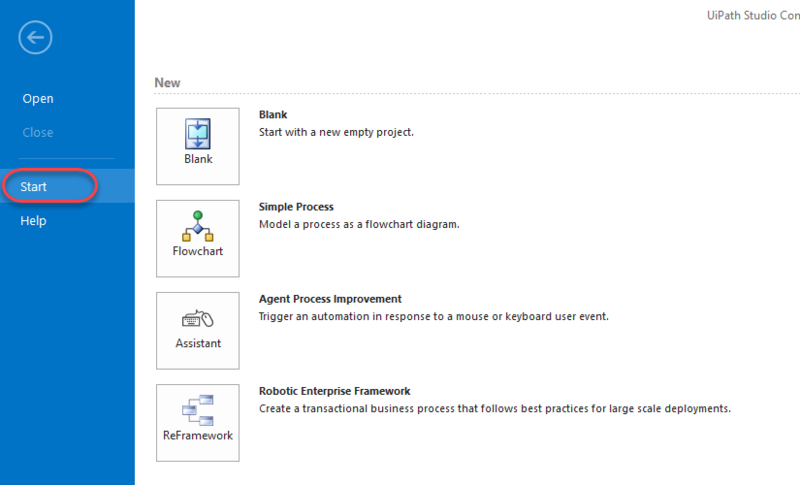 Step 6: Now, perform the manual actions and the tasks that need to be automated. Uipath will automatically run through the sequence of the mouse and keyboard actions. Click on “Save and Exit” button when your recording is completed. 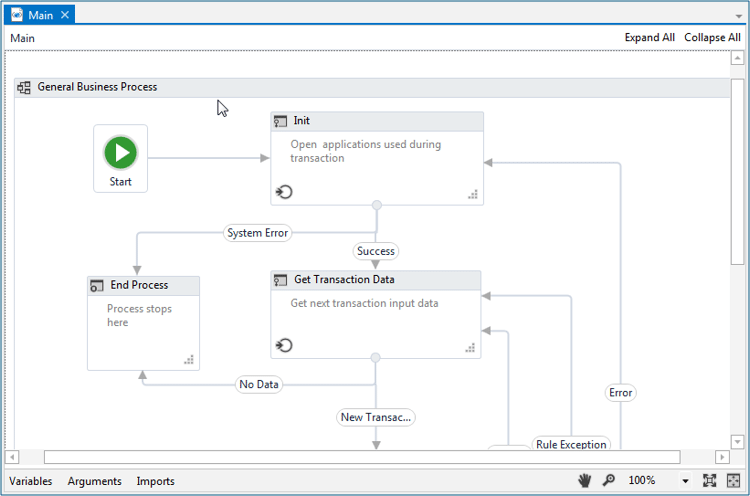 Step 7: All your actions can be seen in the Uipath screen in sequential order. Step 8: Click on “Run” icon, the tool will repeat the recorded actions again. Well, this is the process to create a sample script in Uipath tool. The tool offers a lot of other advanced features which will help to create complex repetitive actions. A Blank project is a fresh project that the user has created. It doesn’t have any templates or any predefined elements. The users will be able to build projects from scratch using this option. 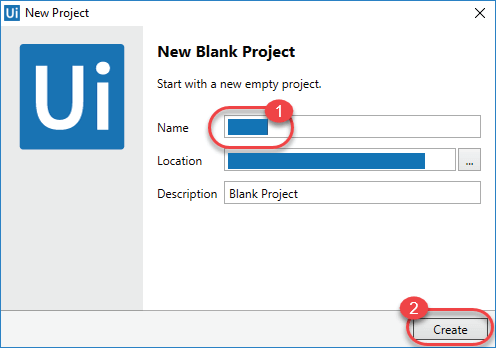 The below screenshot displays a blank project in Uipath. As the name suggests, a simple process provides us with templates of flow charts. A flowchart is nothing but a sequence or order of activities. You can observe the below screenshot for an in-depth understanding. With the use of Agent process improvement, the user will be able to automate the tasks. To explain it’s functionality in detail, let us go through an example provided in the screenshot. Let’s say to you are working on a system and want to cut ( control + X) the task. The best possible option is to right click on the content and choose “Cut” command. Alternatively, you can also select the cut option from the options. In the same manner, you can also align these operations within Uipath tool using agent process improvement. 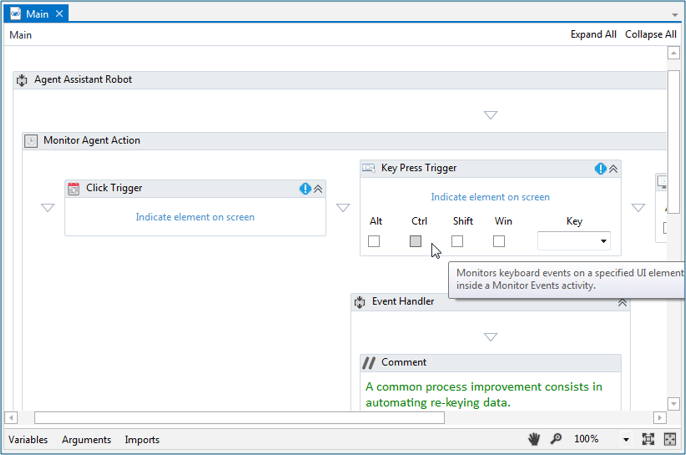 With the help of key process trigger, you can configure all of these commands and further, it can be automated. The below screenshot gives a pictorial view of agent process improvement section. Turning on your windows machine. Starting phase: In this phase, your windows machine will be launched and all the required applications will be loaded. Until and unless these applications are not loaded, the starting phase is not completed. Execution Phase: Once all the required applications are loaded, the starting phase is moved on to the execution phase. In this phase, all the activities can be carried out. Shutting Phase: As and when the use of the windows machine is completed, to turn off the machine, the execution phase is moved on to shutting phase where all the applications are killed. With the use of Robotic enterprise framework, the user will not be moved into another state without completing all the required tasks. This is can be achieved using the robotic framework. Please refer the screenshot below for in-depth understanding. RPA tools have created a positive impact in the market where most of the companies have shown real interest in terms of utilization and reap the benefits that these tools offer. It has definitely gained user acceptance and more opportunities are available in the market because using these tools has drastically reduced the operational costs and increased productivity. Within the current market, there is a scarcity of RPA resources, so if you have 1-2 years of RPA experience, then one can demand a good amount of salary. Jobs like Uipath Developer, Uipath tool user will be able to get about $40,000 to $75,000 based on the experience. The salary quoted can vary based on various factors like experience, demand, location, etc. The future of RPA tools has a positive side to it because most of the companies are investing time, money and energy to get quality resources on RPA tools which will eventually help them to streamline and automate their processes. The use of automation tools has definitely gained some traction in the current market, but Uipath, specifically, has definitely made it spot. The Uipath tool itself has a lot to offer and it has frequent updates where they are providing more features. For example, Data handling techniques, scraping techniques, and desktop automation are few features which differentiate Uipath from other automation tools. Explore Ui Path Sample Resumes! Download & Edit, Get Noticed by Top Employers!Download Now!